Once in a Lifetime: The Extraordinary Story of the New York Cosmos (USA/UK, 2006, Director: Paul Crowder and John Downer, 97 minutes): The North American Soccer League was struggling along through the 1970s until the New York Cosmos, owned by Warner Communications head Steve Ross, decided to bring superstar Pele to the Big Apple. Suddenly, attendance was up, and the Cosmos started winning. Continuing the formula by bringing some European stars over, the Cosmos won several league titles over the next few years. In the process, the once-moribund NASL expanded quickly to 24 teams. Unfortunately, the resulting dilution of talent, and the inability of smaller-market clubs to pay the huge salaries demanded by European or Latin American stars, meant that the league soon imploded. The film tells the story with humour and verve, and it’s hard not to be a little bit nostalgic for the days when 70,000 people would crowd into Giants stadium to watch “the other football.” But ultimately, the Cosmos’ strategy was short-sighted. Building an audience for soccer in North America was going to take time, and the free-spending style of Ross and the Cosmos attracted only fairweather fans, who would melt away as soon as the team stopped winning. Other franchises couldn’t attract enough fans in the first place, and the league suffered as a result. It was interesting that the director admitted afterwards that he is a huge fan of Chelsea Football Club in the English Premiership. Chelsea are following a similar strategy at the moment, with the seemingly endless billions of owner Roman Abramovich funding the construction of another superteam. So far, they’ve won back to back titles in England, but to the detriment of the league, according to many observers. Without a salary cap, the English Premier League drains talent away from the rest of the world, and Chelsea are the richest club of all. This concentration of talent makes the game less competitive in the long term, and while it may attract a few new fans, they’re not the sort of fans who will stick around if and when the team starts losing. Many of the American innovations brought to the game by the NASL have made it into the game in the rest of the world. For example, penalty shootouts to decide games tied after regulation time. This will always be unpopular with football purists, but for the casual fan, it certainly adds excitement to the game. Other gimmicks weren’t so successful, thankfully. Who wants to see cheerleaders at a football match? The only flaw in the film was the absence of any present-day interviews with Pele or Johan Cruyff (who played for the Los Angeles Aztecs and Washington Diplomats franchises), though I believe numerous attempts were made to obtain their participation. 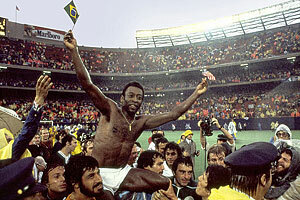 The director Paul Crowder promised lots of fun stuff in the DVD extras, including their attempts to get Pele on board. The NASL Alumni Association arranged a reunion for more than 60 former players in September 2005. This entry was posted in Documentaries, Film Festivals, Hot Docs and tagged #hotdocs06, Documentaries, football, Hot Docs, newyork, pele, soccer, sports. Bookmark the permalink.